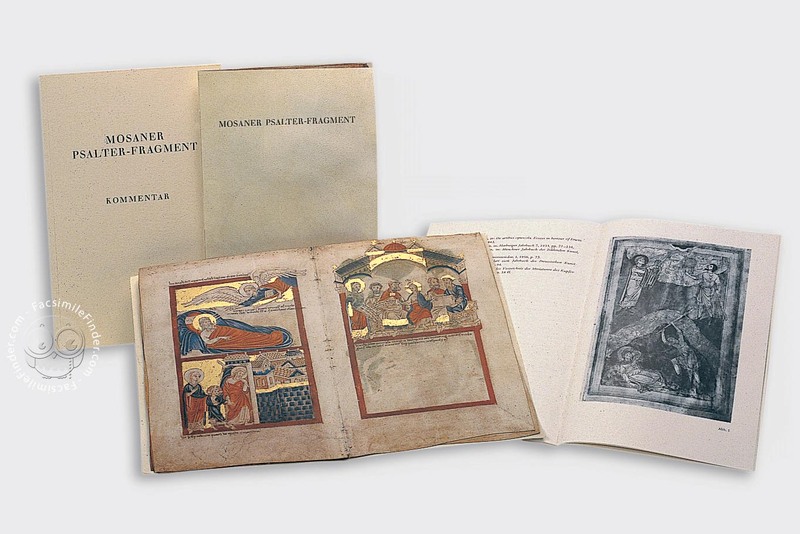 The Mosa Psalter Fragment is a sumptuous manuscript richly embellished with gold, which comprises an illustrated cycle with scenes from both the Old and the New Testaments. Experts consider this fragment as the introduction to a Psalter telling the story of the Bible in pictures. The individual miniatures are merely accompanied by brief thematic indications, so-called "tituli", as well as by some cartouches containing direct speech, recalling our modern comic strips. The magnificent illustrations were made by anonymous masters and are valued as highlights of Romanesque book illumination. The combination of different techniques – pen drawing and opaque colour painting – enchants the beholder with its very special charm. The miniatures show landscapes and architecture applied in rich colours and glittering gold as well as lively moving figures that convey a realistic impression of the biblical narrative. This fragment of a Romanesque picture Bible cycle is extremely important in terms of theology, iconography and history of style. Some compositional elements of the miniatures show late classical, paleo-Christian patterns of Italy as well as influences from the Carolingian and Ottonian traditions. Out of a total of 29 executed miniatures, 15 have been accomplished and 12 have been left unfinished. The two remaining pictures are pen drawings which are partially gilded, an impressive testimony as to how wonderful and of what fine expressive quality unfinished pen drawings may also be. Moreover, they convey an impression of medieval book production, as the gold was not applied by hand or with a brush at the very end, but immediately after the pen drawing had been completed. The execution of such a comprehensive cycle obviously suggests the collaboration of several artists. However, in spite of the diverseness of techniques, despite the colouring which might have been added by various hands and the stylistic differences visible in some details, it may be assumed that one single master was in charge of artistic aspects, planned the overall design and was essentially responsible for the execution of the work. Folios 1-6 of this fragment illustrate episodes of the Old Testament, whereas the remaining folios (7-10) depict Gospel scenes. The individual miniatures are set in three-dimensional red frames which the figures frequently exceed, thus lending them a special liveliness. Researchers value the iconography of this Psalter fragment very highly, as the miniatures present an iconographic wealth which is very unusual for this period. The manuscript is further important in terms of history of styles, as it represents a truly prestigious example of late classical influences. The great majority of the pictures go back to Roman monuments of the 5th century. An immediate infiltration with purely Eastern, Palestinian-Syrian or Byzantine influences is visible only in a few cases. Manuscript book on parchment − 24.9 × 15.6 cm − 20 pp. Full-size color reproduction of the entire original document, Mosa Psalter fragment: the facsimile attempts to replicate the look-and-feel and physical features of the original document; pages are trimmed according to the original format; the binding might not be consistent with the current document binding.